The Terminator franchise helped launch James Cameron’s career to a level few other filmmakers dream of. However, after his first two films in the franchise, he walked away—mostly due to complicated rights issues—and the subsequent sequels suffered for it. Soon, those rights return to Cameron’s camp and he’s planning to produce a new film (or three) in the franchise. But why does James Cameron think the Terminator is franchise worth exploring after all those misses? That retooling, according to Deadline, is happening right now, with a writer’s room brainstorming ideas for Deadpool director Tim Miller to turn into a feature or maybe a trilogy. And star Arnold Schwarzenegger seems to think filming on this hypothetical Terminator 6 starts in March. If and when that happens, Cameron will only produce because he’ll be too busy directing four Avatar sequels. Beyond that nuts and bolts info, there’s no real information on how Cameron or his writers will take the ideas of the Terminator franchise and incorporate or evolve modern themes into them. One small hint that’s being reported is the possibility of Schwarzenegger’s character being a human in the movie who becomes the model for the T-800 cyborg. Some kind of mass cloning thing. However, despite what you may have read, that’s not for sure going to be the story. It’s just an idea Cameron admitted to having. 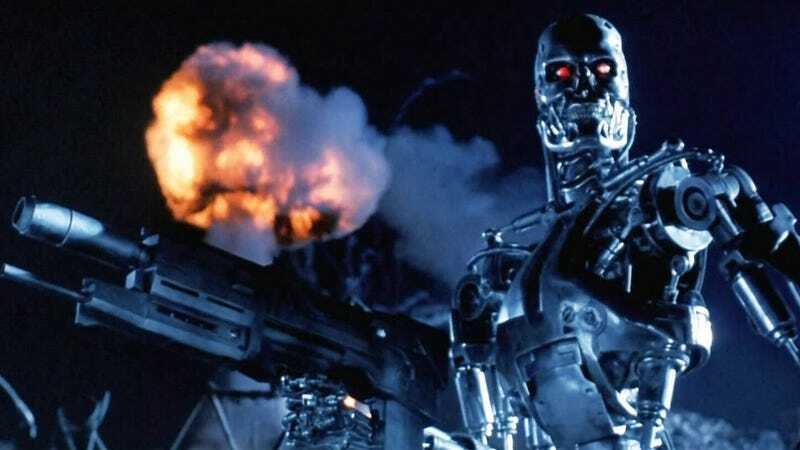 Nevertheless, Terminator is a franchise that constantly has fans hoping and praying for a smart, cool, new entry. The last three films have not lived up to Cameron’s originals but the Sarah Connor TV show did prove there’s life there. With the rights reverting back to Cameron in 2019, and a new movie hypothetically coming the year after that, fans will once again hope and prey that the heart of the franchise returns. And even if it doesn’t, at least we can all remember the good times when Terminator 2 comes back to theaters in 3D August 25.